A Ground Fault Circuit Interrupter (G.F.C.I. or GFCI) is a device that disconnects the power to a circuit whenever it detects that the current is not balanced between the energized (hot) conductor and the return path or neutral (grounded) conductor. There can be many conditions that can cause such a leakage, but they are designed to protect us from electric shock so if a person accidentally comes into contact with any part of the intended current path, providing a connection to ground (earth, earthing, or grounding conductor), the device will trip and disconnect the power within a few thousandths of a second. For example, if you are using your electric razor in your bathroom, and the razor is drawing two amps from the GFCI receptacle, then the circuitry within the device compares the current on the hot wire with the current on the neutral wires. If there is two amps on both lines, the circuit remains energized. However, if you drop the razor into a sink full of water, then some of that current will now be lost using the water as a path to ground. Now you may have two amps on the hot wire, but 1.980 amps on the neutral. The circuitry senses this inequity and trips the device. When the technology was developed several years ago, GFCI’s were only available as a circuit breaker. 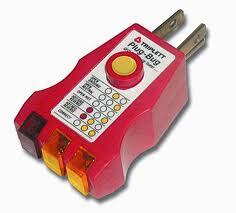 Ground Fault Circuit breakers in many amperages are readily available and are now used for larger loads requiring ground fault protection, and are available in 120 (1-pole) and 240 volt (2-pole) breakers. 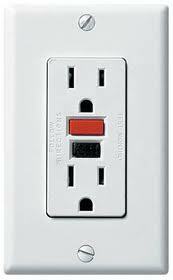 However the most commonly found GFCI devices within our homes are now integrated into a ground fault receptacle. These GFCI receptacles are fed from a regular breaker and are either dedicated circuits or are a part of a circuit that may feed other outlets on that same circuit. The GFCI receptacles are available in 15 or 20A, and are quite affordable when compared to a circuit breaker with ground fault protection built in to them. Ground fault receptacles do not provide over-load or over-current protection. That is the job of the breaker feeding the circuit. I recall as a young electrical apprentice, I decided to conduct my own test of a GFCI receptacle by shorting the path from hot to neutral. To my surprise, sparks flew as eagerly as they would from any receptacle that one might be dumb enough to purposely short out, and the GFCI did not trip, but the breaker feeding the circuit did. When testing the operation of a ground fault outlet, use the integrated test and reset button, or a plug tester designed for testing GFCIs as they are designed to safely check the outlet for proper operation. The devices should be tested on a regular basis as set out by the manufacturer’s recommendations. Replace any GFCI device that fails to trip upon testing. Studies have shown that these devices can, and will fail to operate as designed, and some fail upon random testing right out of the box! You are outside ready to mow the lawn after a few rainy days. You’re wearing leather work boots, but walking through the damp grass has made your boots wet. You plug in your electric lawnmower to the outlet on the side of your house that is a GFCI outlet. The last time you put the mower away, the constant bumping and moving of the mower finally resulted in the hot wire falling off the terminal on the on-off switch of the mower, and is now touching the metal frame of the mower’s handle. The plastic wheels are enough to insulate the mower from the ground so the circuit remains energized as no fault current is flowing. Now you come along and touch the handle with your bare hands, and with your wet boots providing a path, the GFCI receptacle trips instantly, saving you from a potentially lethal shock. If this happens to you, don’t just reset the receptacle and try again or worse yet, plug it into an unprotected outlet. Find the cause of the fault or the repercussions could be deadly! 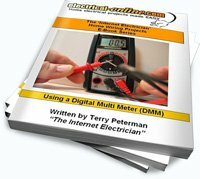 Need to replace a GFCI? Purchase a GFCI or GFCI tester SAFELY and SECURELY online through Amazon. I Changed the Receptacles in my Kitchen, now the Breaker Trips! This entry was posted in Breakers & Circuits, Electrical Wiring, Receptacles and tagged circuit, circuit tester, G.F.C.I., GFCI, GFCI breaker, GFCI outlet, GFCI plug tester, GFCI receptacle, ground fault, ground fault circuit protector, tester, voltage tester. Bookmark the permalink.